9:30 Update: Things seem to be settling down. We're going to move the bulk of this post behind a jump. The only really big news at the moment is that there's a 30% chance of a strong aftershock in the next week, and a 5 to 10% chance of another strong earthquake. If you were lucky enough to feel The Great San Francisco San Jose Alum Rock 5.6 Back-and-Forthing of 2007, please continue to send in reports. 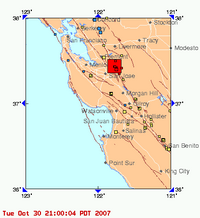 We especially like links to blog posts about the earthquake, such as Greg's. Finally, a headline's gone up on KRON's site; but the headline links to a story about the Berkeley tree sitters. Ha! Hey, we wonder if they got rattled out of their perch? Macherena reports that KRON's just been showing a static shot of a seismograph. Bet it sure would be handy to have a reporting staff right about now. 9:10 Update: Cranky reports that MTV is showing reruns of A Shot at Love with Tila Tequila. BART's running its trains slowly, but with no apparent problems; PG&E reports no utility disruptions. Some broken water pipes reported near San Jose.